P204 SURVEY OF RESPIRATORY PATIENT INFORMATION RESOURCES: ARE THEY READABLE? Introduction and Objectives: Leaflets and health-related websites are important sources of information for patients and should be readily available to help them understand their clinical condition. Well-written information leaflets have been shown to reduce levels of anxiety and result in fewer treatment-related side effects. Health information is best understood by a majority of adults when written for a reading age of 10 years. We aimed to review a large number of commonly available respiratory information resources and to assess their readability. Methods: Respiratory patient information leaflets and patient-targeted websites were chosen to reflect a full range of respiratory diseases. All reviewed leaflets and websites are current (2008). Two readability tests were used: the SMOG index (simple measure of gobbledegook, McLaughlin, 1969) and the FRE index (Flesch reading ease, Flesch 1948). Such readability formulae use sentence and word length to determine a readability score. The scores have been validated against reading age and can therefore be used to estimate the level of education required in order to understand the information. As a comparator, tabloid leader articles published on one day were also reviewed. Results: Forty-seven respiratory information sheets, 14 patient-targeted respiratory websites and eight tabloid leaders were evaluated. The median (range) readability scores and reading ages are given in the table. When either readability tool was used, not one source of information corresponded to the recommended reading age of 10 years or less. The median FRE index value for leaflets and websites corresponded to the “fairly difficult” category. The SMOG and FRE scores were highly negatively correlated (R2 = −0.71, p<0.001). The greatest difference between groups was seen between the websites (most difficult) and tabloids (easiest) (SMOG Kruskal–Wallis χ2 16.8, p<0.001). Conclusions: Respiratory patient information resources are written with a reading age above the recommended level. None of the evaluated patient resources were written at the appropriate adult reading age. In order for patients to make informed decisions about their health, information needs to be presented at a level that they can understand. P205 WHAT INFLUENCES TRAINEES INVOLVEMENT WITH E-LEARNING IN RESPIRATORY MEDICINE? Methods: This study investigated postgraduate trainees’ (F1 and F2) and specialist registrars’ (SpR) e-awareness, their preferred learning styles and their willingness to embrace e-learning in respiratory medicine teaching. All were required to attend regular seminars in respiratory medicine. One week prior to a specific seminar they were asked to study e-learning modules in respiratory medicine (four modules: “diagnosis of respiratory disease”, “respiratory emergencies”, “lung cancer” and “asthma”). At the subsequent session, participants completed questionnaires on their learning styles and on the e-modules. Results: 44 trainees and SpR participated in the study (F1 = 17, F2 = 15, SpR = 12; 14 men, 30 women; mean age 27 years). Approximately half were Imperial College graduates and most had studied in the UK. 25/44 (58%) had minimal or no previous exposure to e-learning. Most (86%) had access to the internet (38/44) at home and 17/44 (39%) used the internet for education purposes three to four times a week. Most (95%) stated their preferred teaching source to be face to face contact with a teacher. More than half (61%) scored highly for collaborative learning styles. Very few participants (34%) had used any of the e-learning modules before their training session (15/44). There was no correlation between previous exposure to current or previous e-learning use and personal learning style. Conclusions: This study suggests that there is a low usage of E respiratory modules by postgraduate trainee and such modules need to be firmly embedded within training schedules to ensure maximal participation. Trainees have a diversity of experiences and their opinions and approaches to e-learning cannot be predicted from learning style questionnaires.
. BMC Med Educ 2007;7:41.
. Medical Teacher 2006;28:477–9 . Background: Opportunities for learning from real patients have decreased. Self-directed learning at times suitable for shift patterns are increasingly likely to become important. This study reports on the design and evaluation of game-based learning activities for virtual respiratory patients in Second Life. Methods: A virtual teaching hospital was created in Second Life (http://www.elearningimperial.com/index.php?option = com_content&task = view&id = 37&Itemid = 58). A respiratory ward has been designed with a pneumothorax patient focussing upon game-based learning activities (requesting investigations and planning management). Similar material was available as part of a respiratory emergencies e-learning module embedded in the year 3 medical undergraduate curriculum. Initial data about gaming competence was obtained from 118 full-time undergraduate medical students (mean age 22 years) who volunteered for the study. A stratified sample of 50 students was selected according to gender and high and low gamer categories and was randomly assigned into two groups. One group (23/25 attended) was given access to the game-based learning activities in Second Life and the second group (19/25 attended) was given access to the same content delivered as an interactive e-module. After use of the modules students in both groups completed a questionnaire involving 21 statements related to affective components, perceived control, perceived usefulness and behavioural components (scored on a 5-point Likert scale). χ2 or Fisher’s exact test was used to compare categorical variables between both groups. The questions were combined into groups 1–3 (disagree) and 4–5 (agree). Results: There was no evidence of a difference in general attitude for Second Life (p = 0.66) or the e-module (p = 0.86) between gender. There was some evidence of an association between gaming competence and gender for Second Life (p = 0.03) or e-module (p = 1.00). Conclusions: The results suggest some evidence of an association between previous gaming experience and gender in favour of Second Life, but the pilot study shows that significant previous experience of Second Life is necessary for this learning activity. The current technology limits the number of learners that can attend the virtual patient in the same way as physical space limits the number around a bed in an existing hospital ward. Raising public awareness of a disease is an important part of both prevention and cure. Teaching children is one way of increasing public knowledge as this also teaches their parents and guardians. We describe a method of teaching children and their parents from an inner city primary school about tuberculosis and demonstrate a positive impact on their knowledge of tuberculosis. A project was devised by Biolink, a group involved in teaching science to primary school children, in conjunction with the respiratory department at an inner city hospital, which aimed to raise awareness of tuberculosis. This involved working with a group of children aged 6 and 7 years from a primary school local to this hospital. Tuberculosis is an especially relevant topic in an area where tuberculosis prevalence is >50/100 000. Through drama and role play the children were taught about basic lung function including gas exchange, the diaphragm and red and white blood cells, followed by important basic aspects of tuberculosis such as the cause, how it spreads and the importance of antibiotic treatment. This was done over a series of three interactive lessons and the children acted the parts of inflammatory cells, bacteria and antibiotics in a “set” representing a giant lung. The role plays used in these lessons were then amalgamated into a performance, which was presented to the children’s parents and guardians. It was hoped that this would also teach the adults about tuberculosis. In order to assess the impact of the performance on the audience, they were asked to complete a self-assessment questionnaire before and after the performance. Eighteen questionnaires were analysed. There was a significant improvement in the adults’ perception of their knowledge of tuberculosis after the performance compared with their previous knowledge (p<0.01; 95% CI 6.7 to 24.9). The children thoroughly enjoyed the experience and reported some understanding of the topics. The impact would probably have been greater, however, in a slightly older group of children. Interactive sessions such as role play allow children to identify more strongly with the topic and repeating theories through rehearsals and a final performance can help learning. P208 EVALUATION OF BRONCHOSCOPY TRAINING: DO RESPIRATORY TRAINEES FEEL THAT IT COULD BE IMPROVED? 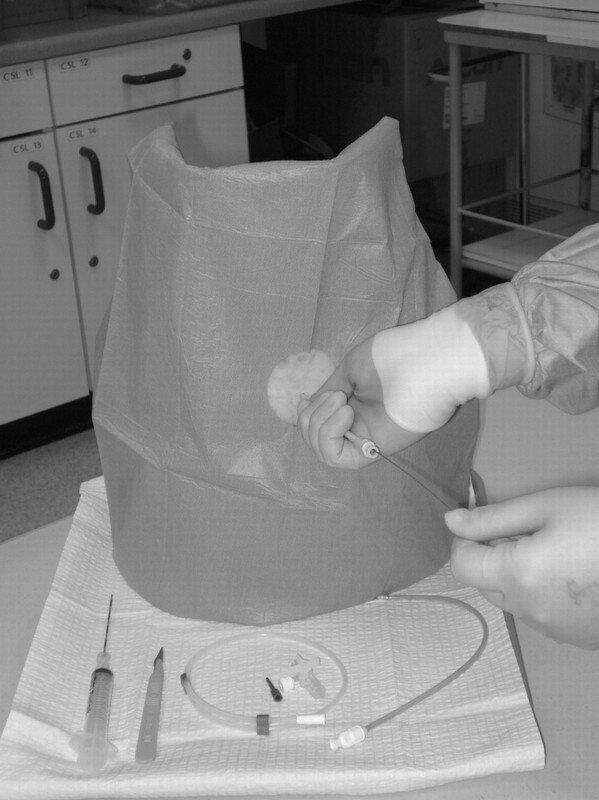 Introduction: It is established that one-to-one supervision is the key element of bronchoscopy training, but apart from this surprisingly little is known about how bronchoscopy is taught. I designed a qualitative study to: investigate the training adjuncts that registrars utilise; evaluate whether they view their training as “fit for purpose” and explore how training might be improved. Results: 27 SpR, who had performed their training bronchoscopies in 13 different hospitals, replied to the initial questionnaire (77% response rate). They used, on average, one training adjunct (see table). The poor uptake of these was due to poor access and, with the exception of the bronchoscopy simulator, because SpR perceived that they could only enhance cognitive skills and not technical ability. Prescribed competencies were not being attained prior to the trainees performing unsupervised bronchoscopy. In particular, one of the SpR “managed to get to year 5 without doing a single transbronchial biopsy”. Another trainee who was performing independent bronchoscopy “wouldn’t know particularly what to do” in the event of a serious iatrogenic haemorrhage. SpR identified that the curriculum could be improved by: an introductory course; designing rotas that promote consecutive attendance to bronchoscopy lists in the first year; encouraging trainers to provide more feedback; providing targeted tuition on writing bronchoscopy reports and performing bronchoscopy on the intensive care unit and improving access to simulators. Conclusion: Current training arrangements have limitations that trainees can readily identify and there is evidence to suggest that they may not enable some trainees to perform unsupervised bronchoscopy adequately.
. Qualitative research in health care. Analysing qualitative data. BMJ 2000;320:114–16. P209 BRONCHOSCOPIC YIELD IN THE DIAGNOSIS OF LUNG CANCER: IS IT OPERATOR DEPENDENT? Introduction: Fibreoptic bronchoscopy (FB) is a common test in the diagnosis of lung cancer and is regularly performed by trainees. BTS FB guidelines recommend a minimum diagnostic yield of 80% for endoscopically visible malignancy. The impact of experience on diagnostic yield at FB is unclear. We retrospectively reviewed our experience to determine whether there was a difference in yield between trainee and consultant performed FB. Methods: Data for all FB performed between December 2005 and November 2006 including operator, macroscopic appearance and pathological diagnosis were collected and compared with our lung cancer MDT outcome data. Staging computed tomography was performed prior to FB. Results: 531 patients had a FB of whom 146 had a final diagnosis of lung cancer. 26 operators performed FB. 107 patients had positive histology/cytology via FB (73% yield). 132 patients had macroscopically abnormal mucosa reported (102 positive samples, 77% yield). 34 of the 39 patients with negative FB histology/cytology had further diagnostic investigations. Consultants performed FB in 49% (n = 71), trainees alone performed 36% (n = 52) or trainees assisted by consultants performed 15% (n = 23). Consultants had a significantly higher positive diagnostic yield than all trainees (83% vs 64%; p = 0.014) and trainees operating independently (83% vs 62%; p = 0.012). There was no statistical difference in histological yield between FB performed by consultants and trainees assisted by a consultant. There was no significant correlation between the number of FB performed by an operator and cancer diagnostic yield, although numbers were small for most operators (see table). Conclusion: We have shown that in lung cancer patients the bronchoscopic diagnostic yield of consultants is higher than that of trainees. Failure to obtain histology at FB delays management and subjects patients to additional diagnostic tests. We conclude that patients with suspected lung cancer should have bronchoscopic biopsies performed by consultants. Introduction: Seldinger intercostal chest drain (ICD) insertion is promoted as a simple procedure and MMC stipulates that all specialist trainees (ST) should achieve competence. However, no formal training is available in most hospitals. The May 2008 Rapid Response Report from the National Patient Safety Agency reported 12 deaths and 15 cases of serious harm over a 3-year period to March 2008, related to chest drain insertion, indicating a lack of expertise. We describe a model that adequately addresses this deficit in training. Methods: The extent of experience and confidence in ICD insertion of general medical specialist registrars (SpR) in the West Midlands Deanery was assessed using a questionnaire. All SpR and ST on-call for A&E and acute medicine at Sandwell Hospital were then invited to train using a porcine model with feedback on each session recorded (see fig). Results: Fifty questionnaires were completed by SpR at a West Midlands general internal medicine training day. The median number of ICD inserted was 10–15 (range 0–>50). 69% had inserted less than 10 large bore ICD in their whole careers and 53% of non-respiratory trainees were not confident in the procedure: 72% of all trainees felt formal training would be of value. Of 47 on-call doctors at Sandwell Hospital, 27 have completed a 2-h course (five sessions in 2 months). 100% confirmed the training to be realistic and beneficial with significant improvement in confidence. Conclusions: Non-respiratory trainees are inadequately trained and lack confidence in ICD insertion. The porcine model is effective in the training of doctors who are required to site ICD in the acute setting. In order to ensure patient safety, all trainees should be trained and assessed using a model. Training sessions are becoming mandatory and require formal incorporation into job plans to be sustainable. Introduction: The pressurised metered dose inhaler (pMDI) technique should be tested in poorly controlled asthmatic patients.1 This service evaluation aimed to assess uncontrolled patient ability to learn to use a pMDI using the aerosol inhalation monitor (AIM; Vitalograph), which tests inspiratory flow, synchronisation and breathholding. Method: The enhanced asthma care service (EACS;i since February 2006) provides detailed clinical review by trained asthma nurses, according to agreed practice protocols. Practices determine a proxy measure of control—the total number (4–6) of short-acting beta-2-bronchodilators prescribed in 12 months. This, together with 77 predetermined clinical parameters (including prescribing and healthcare utilisation data) formed the basis of detailed discussion with the practices before and after selected patients complete postal symptom questionnaires (RCP three questions);1 symptomatic patients were then invited for a practice pre-agreed clinical review, which included inhaler technique. All patients using pMDI had at least two assessments using AIM since January 2007. In most cases, technique education was provided after testing if appropriate. We present data for patients previously prescribed pMDI seen from 1 April 2008 to 30 June 2008. Results: 2123/8843 (24%) symptomatic asthma patients were invited from 100 practices caring for approximately half a million patients, including 30 779 diagnosed with asthma (prevalence 6.9%). 1291/2112 (61%) of those reviewed were using pMDI (mean age 52 years; SD 21.37). 685 (55.4%) and 368/1236 (29.8%) were in BTS steps 2 and 3, respectively. 1092/1275 (85.6%) using pMDI failed the first AIM test. There was a statistically significant increase in the numbers of patients able to use their pMDI correctly following instruction, after the second (129 to 260 of 1197 patients, p<0.01) and third (61 to 181 of 528 patients, p<0.01) tests. However, 909/1197 (76%) and 323/527 (61.3%) of those tested twice and three times, respectively, failed on these subsequent attempts, despite instruction. Over 54% and 60% failed the inspiratory flow criterion on the second and third tests, respectively. A logistic regression failed to show any effect of age and BTS step on these outcomes. Conclusion: Despite training, a significant majority of symptomatic asthma patients are unable to use pMDI correctly. iThe EACS service is an independent nurse service sponsored by TEVA UK Limited. P212 DO SECONDARY SCHOOL CHILDREN KNOW HOW TO MANAGE THEIR ACUTE ASTHMA? Background: Adolescents are particularly vulnerable to acute asthma attacks because of poor compliance, lack of understanding of diagnosis and treatment and poor acceptability of treatment. Objectives: To determine whether children at secondary school knew how to manage their acute symptoms. To evaluate whether they carried their reliever inhalers at all times. To understand their reasons for not carrying the reliever inhalers. Method: A questionnaire survey was conducted to evaluate the effectiveness of our current adolescent asthma education in a tertiary respiratory clinic over a 4-month period. The questionnaire had two parts; the first part filled by the patient/parent and the second part by a nurse or a clinician about knowledge of managing acute symptoms. Results: 40 patients were enrolled, with patients ranging in age from 11 to 17 years. Nearly one in five patients did not know how to manage their acute symptoms. Although 85% of patients reported carrying their reliever inhaler most of the time, only 57% were doing so in the clinic. Furthermore, only approximately half of the patients reporting exercise-induced symptoms were carrying their reliever inhalers. The main reasons were related to the prescribed devices (eg, spacers too big to carry). Excluding patients with severe asthma on adjunct therapy (eg, methotrexate, oral steroids), there was no association between the rate of inhaler carriage and severity of asthma. 40% of patients preferred to receive asthma information in an electronic format (compact disc (CD) rom, text, e-mail) rather than in a leaflet. Conclusion: Significant proportions of adolescents continue to have poor knowledge of acute symptom management and poor inhaler carriage despite regular education in the specialist asthma clinic. Different media (eg, CD, e-mail, mobile phone texts) might be better in actively engaging adolescents in the education process and in reinforcing the information provided during the consultation. Therefore, it might be necessary to consider not only patient preferences for device but also their preferred medium of education.